My take on Episode 1...I read that it actually got a very discouraging ratings. But I personally don't care! :-) I like Jung So Min who plays Oh Ha Ni. She's rather cute and fitting with the role. I haven't seen her yet in any shows, so I really don't know what to expect. But I guess, she rather plays her role well. In the first episode, screen time are more of her and in fairness, I don't find her that annoying and her expressions are not really that I can call overacting. One thing though, I'm not fond of the day dreamings stuff. They just take so much time to deliver an overly simple dream! I only like the part where she's playing Trinity in the Matrix! :-) I appreciate a gutsy girl, Bring it on type of character! There's really little to rave about the first episode, it's basically what you see in the previews, so get on with it! Also, finally, they share a lot of screen times here! As it should be, obviously! No spoilers intended! 8 years after I wrote this post...there's a new Meteor Garden in town. It's taking the dramaverse by storm, it makes me miss Kim Hyun Joong, just because I watched for the nth time Boys Over Flowers. 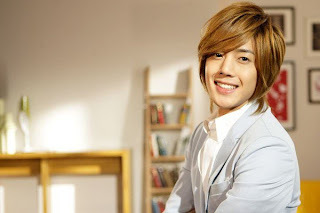 I cannot get enough of Ji Hoo sunbae, so I re-watched Playful Kiss. Oh I never did went back to finish all my ravings after writing about Ep 1 & 2. But my, my, what a treat.